With Drupal’s commitment to reinventing itself to enable ambitious digital experiences, the community is getting ready for the launch of Drupal 9, and end-of-life for Drupal 7 and Drupal 8. Built on the same core as D8, and a set of new features with backward compatible code, Drupal 9 will emerge out of Drupal 8. Core developers need at least one year to prepare Drupal 9. It won't be that complex to move from 8 to 9 compared to how it was from 7 to 8. As long as contributed modules won't use deprecated APIs, they should work well with Drupal 9, while being compatible with Drupal 8. Site owners will get one year to migrate from Drupal 8 to Drupal 9. Since Drupal 8 is working so well with its minor releases and innovative model, the release of Drupal 9 doesn’t look meaningful. However, that’s not the case because Drupal 9 won’t be reliant on Symfony 3. Drupal 8’s end-of-life has been aligned with that of Symfony 3, in November 2021. However, between now and then, that will be two more minor releases for Drupal 8 that is Drupal 8.8 and Drupal 8.9. 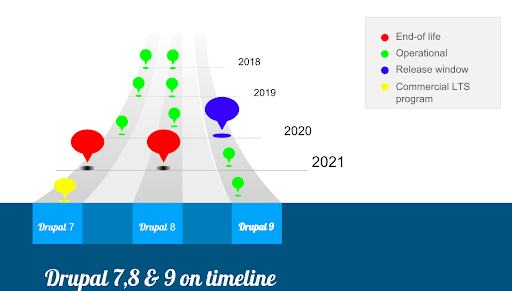 While ideally, Drupal 7 end-of-life would have been soon after the release of Drupal 9, it’s been extended till November 2021. It’s also announced that Drupal 7 will have a commercial long-term support program for vendors even after end-of-life. Another important question is since the end of life of Drupal 7 & Drupal 8 will happen together, so those who have Drupal 7 need to move to Drupal 8 before moving to Drupal 9? Though we can definitely take a jump from Drupal 7 to Drupal 9, it won't be an unadorned upgrade. Drupal 9 is built on the same underlying frameworks as Drupal 8. It is also planned that before end-of-life, Drupal 7 will be made compatible with newer versions of PHP according to their release schedules and contributed and custom modules will be updated too. Reforms like this will definitely affect both community-driven modules and any custom code you may have as well. So If we want to continue with Drupal 7, we should focus more on user experience. Our Drupal experts have weighed in on the Drupal 9 release, what to expect, and the right course for D7 to D9 migration path. Take a look. If your enterprise digital experiences are built with Drupal 7 or 8, and you wish a get a head start on Drupal 9, our expert teams can help. Just drop us a line, and our teams will be in touch.